If the packet times out, it is resent with the TTL equal to the distance to the target minus one. 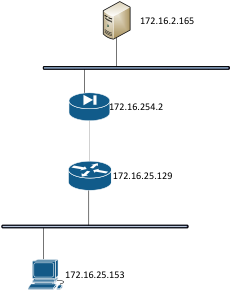 If an ICMP type 11 code 0 (Time-to-Live exceeded) is received, the packet was forwarded and so the port is not blocked. If no response is received, the port is blocked on the gateway. 3. Several packets are sent with TTL=3 to the destination varying the destination port. The sequence goes as follows: A first packet is sent with TTL=3. If a timeout occurs, a second packet is sent with TTL=1. If an ICMP type 11 code 0 (Time-to-live exceeded) is received, the gateway is forwarding the packet.